Has anyone else noticed the Facebook "On this day in..." notifications to the right hand side of the screen (web version)? Have a glance at the picture on the left and you can see what mine looked like a couple of days ago. 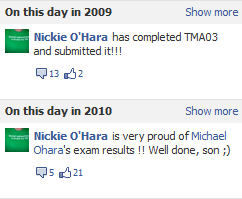 Strangely related and sort of interesting so I almost put as my Facebook status, "Well, on this day in 2009 I was submitting an OU assignment" because we do that, don't we? We update our social networks with random observations but why repeat something from a couple of years ago? Who else is going to be interested AGAIN? Also, I saw that there is a Twitter account that is retweeting every single tweet from Twitter, in chronological order, from the beginning of "twime" (sorry...). At the time of publication @wetreet was up to July 2006 and it's a whole different world. It really was micro-blogging back then with hardly any @replies. I mentioned on my "I'm a Twitterholic" post that you used to be able to see everyone in the Twitter timeline and that's where a lot of my original followees came from. Yes, it was quieter back then but it was also a lot less interactive. It would be very strange to go back to that now although I do miss being able to see tweets from anyone and everyone. Again, I thought about tweeting out about the @wetreet account but what happens when @wetreet gets round to retweeting that exact tweet from today. Will the account self-combust? Are we in danger of creating a social media Möbius Band?